A former Anglo Irish Bank executive said he planned to "get a bit of drink" into a Credit Suisse banker at an upcoming dinner and say to him: "I'd like about five billion before the 30th". Matt Moran, former chief financial officer at Anglo, was giving evidence for a third consecutive day at David Drumm's conspiracy to defraud trial, at Dublin Circuit Criminal Court. The jury listened to an extract from a recorded phone call between Mr Moran and John Bowe, former Anglo head of capital markets, on day 36 of the trial. 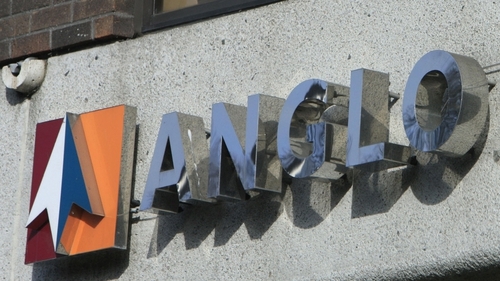 The phone call took place on 22 September 2008, eight days before Anglo's year end accounts were due to be published. The two men discussed what might be said to Credit Suisse banker Ewen Stevenson, at an upcoming dinner meeting. Mr Moran told Mr Bowe "Look, if I can get a bit of drink into him, I might say to him, I'd like about five billion before the 30th." Mr Bowe suggested they could "get him to sign the beer mat", and asked if Mr Stevenson might be prepared to "give us a little kind of one-night stand." Mr Bowe then suggested that Credit Suisse are told Anglo will do a deal with them "on the capital side", and said Anglo will place money with them. Mr Moran asked if the transaction involves "one set of cash". "Yeah, you don't need the physical cash," Mr Bowe replied. Mr Bowe said Anglo would give Credit Suisse eligible assets or cash and "just run the cash in one door and out the other." Mr Moran then asked if Anglo had the requisite cash to fund such a transaction. "What we do is we pay them and they pay us, do you know what I mean, yeah?" Mr Bowe said. Mary Rose Gearty SC, prosecuting, told the jury that all calls on Mr Bowe's phone line were recorded by the bank as matter of course, given he was a member of the treasury team. She asked Mr Moran if the banker referred to during the recorded conversation played in court was Mr Stevenson, of Credit Suisse Bank. Mr Moran replied that it was, and said he knew Mr Stevenson personally. Ms Gearty then asked if the transaction with Credit Suisse, discussed during the recorded phone call, had taken place. "No it didn't," Mr Moran replied. Mr Drumm's trial has heard he accepts that transactions worth €7.2 billion between Anglo and Irish Life and Permanent took place in 2008 but he disputes they were fraudulent or dishonest. Yesterday, the jury viewed an email Mr Drumm wrote to colleagues suggesting they meet to discuss key issues "with a war cabinet urgency". In the email sent on 12 November 2008, he said a larger group should get around the table to manage the key issues the bank was facing at that time. In another email viewed by the jury, written in September 2008, Mr Drumm told Anglo colleagues it was "crunch time for us". "A massive push needed, guys, look under every rock," he wrote, as liquidity levels at the bank continued to plummet. Mr Drumm, with an address in Skerries, Co Dublin, has pleaded not guilty to conspiring with former bank officials Denis Casey, William McAteer, John Bowe and others to defraud depositors and investors at Anglo by "dishonestly" creating the impression that deposits in 2008 were €7.2bn larger than they were. He has also pleaded not guilty to false accounting on 3 December 2008, by furnishing information to the market that Anglo's 2008 deposits were €7.2bn larger than they were. The trial, nearing the end of its fifth week, continues before Judge Karen O'Connor and a jury.